BIO-WEST worked on the most comprehensive biological evaluation ever conducted on Comal and San Marcos Springs near Austin, Texas. The study was a response to concerns about the impact of low recharge and corresponding low spring discharge on threatened and endangered species found within the Comal and San Marcos Springs ecosystems. During the 7-year study, we monitored and researched each of the eight threatened and endangered species found in those ecosystems. The monitoring and research plan was developed in coordination with the Edwards Aquifer Authority and the US Fish and Wildlife Service (USFWS) in May 2000, with additional input from a Technical Advisory Group during the scoping process. Over the course of the study, many scientists provided scope input or comments, assisted in study design, and/or participated in fieldwork activities and data analysis. Four of the five special studies were designed and conducted in conjunction with the USFWS National Fish Hatchery and Technology Center scientists or Texas State University professors and graduate students. 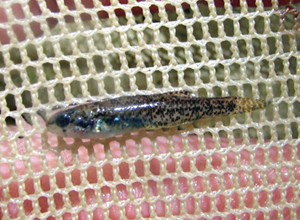 We studied two fish species (fountain darter [Etheostoma fonticola] and San Marcos gambusia [Gambusia george]), two salamander species (Texas blind salamander [Eurycea rathbuni] and San Marcos salamander [Eurycea nana]), one plant species (Texas wild-rice [Zizania texana]), and three invertebrate species (Comal Springs dryopid beetle [Stygoparnus comalensis], Comal Springs riffle beetle [Heterelmis comalensis], and Peck’s cave amphipod [Stygobromus pecki]). During this study we gathered valuable information on habitat conditions and water quality in relation to these species, as well as monitoring data on current population dynamics. 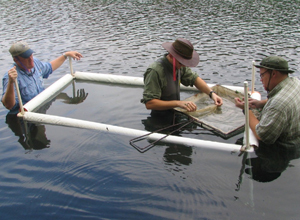 According to our studies, aquatic vegetation in both systems provides physical habitat for threatened and endangered species and other aquatic life, provides a direct food source, supports diverse and abundant macroinvertebrate communities that subsequently provide a food source for organisms higher in the food web, and assists with regulating water quality. The 7-year study period was characterized by variable discharge conditions ranging from floods to extended drought. This substantial variation in discharge provided valuable information on flow-related responses of the biological communities and confirmed that the Comal and San Marcos Springs ecosystems are truly dynamic. Water quality parameters measured over the course of the study varied only slightly and appeared to be influenced primarily by groundwater inputs from the Edwards Aquifer. Overall, water quality was within the range required to sustain these threatened and endangered species.